Bangladesh is one of the poorest, most densely populated, least developed countries in the world. Apart from its lowly economic status, major impediments to growth have included frequent cyclones and floods and the slow implementation of much-needed economic reforms. The country has a reputation for the inefficiency of its state-owned enterprises. This report looks at the country’s surprisingly energetic telecoms sector, in particular, the effort that has been going into building telecom infrastructure and the progress that has been made on regulatory reforms. Some key measures of the status of telecommunications in Bangladesh are also provided. We have conducted the literature search connected to the topic to support and direct the research. This search was mainly conducting on the University databases, Journal databases, Library Journals, websites and Textbooks. We have searched the databases provided by University library access, like Emerald, Business Insight, ABI/Inform, Global Information Inc (professional Research reports) and search engines like Google scholar and university special search engine connected to all databases and textbooks. The key words mainly used were Bangladesh Telecom industry, Telecom future, Trends in Telecom, Bangladesh telecom Market. In the full range of articles and journals on the subject of internationals marketing, investing in a new market, the We have found one of them very useful on the subject of “Bangladesh Telecom Brief 2004” This paper tells the inside of offering and the potential what Bangladesh market offers, not exactly the same subject but one major side of our paper has the subject of same interest. The Theoretical Framework has been created with the help of some text books on International Marketing and marketing in general. Text books of marketing such as “International marketing” by Cateora & Ghauri (2006), “Internationall Marketing” by Bennett & Blythe (2002) and On Competition of Porter M. (1998) has been used for this project. Many foreign investors are now interested to do business in telecom sector in Bangladesh which reveals that Bangladesh has become a significant hub for telecoms. It has been forecasted that the average revenue from telecoms sector will be Tk1500crore2 a year. Bangladesh is a country which is densely populated and also is a flat and easily extends able coverage. The infrastructure and Tele-density is low which on the other hand made the market a perfect place for telecom business. The demand is very high and the consumer base is very large but the investment is low because of the topographic layout. The government has a receptive foreign investment policy with no restrictions on repatriation of profit. Even though the current infrastructure is not much developed but it is suitable for foreign investment. Bangladesh has a huge potential in WiMax and submarine cable which is a new technology in the country and has attracted the foreign telecom operators. Many foreign telecom operators are coming to Bangladesh to explore the potentiality of the technology. Some interested international telecom operators who want to start a business in Bangladesh are UK-based Orange Telecom, South Korean SK Telecom and UAE’s Etisalat. BIS Shrapnel, has launched its Bangladesh Mobile Telecommunication, 2005 report. Report author Mr Priyam Shah explains that Bangladesh’s mobile phone market has achieved exceptional growth since the beginning of 2004, registering a massive 100% growth in its subscriber base during 2004, and 137% during 2005. This trend is forecast to continue over the coming years, bringing the subscriber base to 58.2 million by 2010. According to Mr Shah, recent growth in the Bangladesh mobile market can be attributed to factors such as the deregulation of the telecommunication sector, low levels of tele-density, inadequate fixed phone infrastructure, high competition following the entry of two new operators (Banglalink and Teletalk) and, particularly, massive foreign direct investment (FDI) by telecom giants like Telenor, Telekom Malaysia (TM), Orascom, SingTel, and most recently by UAE-based Warid Telecom. Mr Shah explains that foreign operators, in collaboration with local partners, have been working with the infrastructure to remove entry barriers and make mobile telephony more affordable and widen the base of mobile subscribers. According to Mr Shah, the entry of Banglalink in February 2005 has sparked a price war. Banglalink’s attractive launch offer included a new connection and handset at a low start-up cost of US$51. Following Banglalink, three other private operators – Grameen Phone, Aktel and CityCell – have also come up with various value-added offers resulting in an intense price battle. The development of a competitive mobile phone market is expected to prompt an easing in cellphone tariffs going forward, after years of escalation in what was a captive market. Consumers will also benefit from cheaper connection and call rates. State-owned operator Teletalk, however, is expected to struggle in this new environment as it is still grappling with poor network coverage and inefficient management. Controversially, the country’s 2004/05 annual budget (delivered in June 2005) imposed a tax of US$18 on each new SIM card connection, raising a huge furore among cellphone operators. Operators think that the new tax will pose a serious entry hurdle for low-income earners and will significantly stifle growth expectations. In tandem with the growing subscriber base, sales of mobile handsets has increased at a phenomenal pace. However, nearly 70% of mobile handsets available in the local market have been entering through informal channels, depriving the Government and importers of a huge amount of revenue each year. In a serious bid to turn around this drastic situation, the Bangladesh Government reduced the tax on mobile handset imports from US$22.50 to only US$4.50 in mid 2005. Mr Shah explains that although this initiative has revived the situation to a certain extent, the effect on the grey market has not been as significant as was expected by distributors and importers. Interviews conducted by BIS Shrapnel with leading distributors reveal that the grey market is currently holding around 40% market share, but they are hopeful this will diminish over the coming months. According to BIS Shrapnel research, Bangladesh’s mobile handset market is dominated by first-time users (nearly 85%), as the country is still in its infancy in terms of mobile phone usage. Further, 80% of the handset market is dominated by ultra-low to low-end handsets, available for less than US$68, due to the country’s low per capita income levels. As with many other Asia-Pacific countries, the Bangladesh mobile handset market is predominantly captured by global handset giant Nokia (approximately 52% market share) followed by Siemens. Mr Shah explains that the success of these two vendors can be attributed to excellent handset quality, ease of use, an efficient sales and distribution network, dedicated after-sales service, and regular launches of low-priced handsets to meet market demand. Grameenphone – Joint venture ownership 62%Telenor and 38%Grameen Telecom . Banglalink – Joint venture with Orascom Telecom Co. originated from Egypt. Waried Telecom – An investment of Dubai and Abu Dhabi Group UAE. TeleTalk – Public limited company but 100% share have been owned by the government of Bangladesh. Citycell – Joint venture with SingTel Asia pacific investment Pvt. limited. Figure: Bangladesh Mobile operator’s market share. (BTRC 2008 ) *Subscribers in Millions. Over the last two to three years, the number of mobile subscribers in Bangladesh has been more than or close to more than doubling on an annual basis. By end-2007, the subscriber base had reached 34 million and was continuing to grow at an annual rate of around 60%. With the momentum that has been developed on the back of the government’s deregulation process, the strong growth seemed likely to continue. The entry of new operators into the market has certainly helped to further boost the competitive environment. This report describes how the mobile market is growing and the impact this is having on the developing nation, as well as providing an outline of the main players. The report also has a brief overview of the TV broadcasting sector. Grameenphone is a GSM (global system of mobile communication)-based cellular operator in Bangladesh. It has started operations on March 26, 1997. 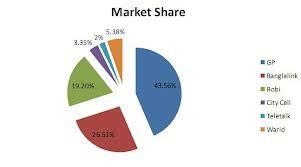 It is partly owned by Telenor (62%) and Grameen Telecom (38%). Grameenphone is the largest mobile phone company in Bangladesh with 23.04 million customers as of october, 2008. It is also one the fastest growing cellular telephone network in Bangladesh. At the end of 2008, it had about 5200 BTS (Base Tower Stations) around the country. Grameenphone’s stated goal is to provide cost-effective and quality cellular services in Bangladesh. On the 16th of November, 2006 GP formally changed its logo to match its parent company Telenor’s logo. According to GP the new logo symbolizes trust, reliability, quality and constant progress. Grameenphone has already picked up 425 core taka of Non-convertible Senior Coupon Biasing Bond @ interest rate of 14.5 by the help of ten financial group of the companies. The company is recently going to call for IPO (Initial Public Offering) to collect capital from share market of the country of 6 core 50 lakh dollar (449 core taka). GP has submitted the prospectus of proposal for IPO in 12/12/2008 to the chairman of SEC (Security and Exchange Commission). The name of present CEO of GrameenPhone is Odver Heszedal. The name Grameenphone was kept as part of the new identity because the name Grameenphone carries with it all of the heritage, success and values of the companies past, added the then CEO of Grameenphone Erik Aas. Hawaii, and Ericsson provides technological support to GrameenPhone. The tower range of GP exists 5-7 km. The technology used by Grameenphone is 1G (First Generation) which is supportable to 2G (Second Generation). Grameenphone offers subscription in two categories, Prepaid Subscription and Postpaid Subscription. djuice (a youth based mobile to mobile connectivity within Bangladesh). Grameenphone also offers different value-added services including SMS, MMS, Welcome Tunes (Ringback Tones), Voice SMS, SMS Push-Pull Service, Voice Mail Service (VMS), and Fax and Data among others. Grameenphone was the first mobile operator in Bangladesh to offer EDGE services to its subscribers. With the help of Grameenphone, Grameen Telecom operates the national Village Phone programme, alongside its own parent Grameen Bank and the International Finance Corporation (IFC), acting as the sole provider of telecommunications services to a number of rural areas. Community Information Center (CIC) or GPCIC is aimed at providing internet access and other communications services to rural areas. In February 2006, 26 CICs were established across the country as a pilot project. In this project, Grameenphone provides GSM/EDGE/GPRS infrastructure and technical support and other partners Grameen Telecom. A grameenphone center (GPC) serves as a “one stop solution” for customers, with all telecommunications products and services, under a single roof. A grameenphone center also sells phones from vendors like Nokia, Samsung, Motorola,Sagem and Benq. EDGE/GPRS modems and accessories such chargers and headphones are also sold at GPCs. It contributes its responsibilities toward countries education, empowerment & health sector. Beautification of the city towns. It is the official sponsor of Bangladesh Cricket Board (BCB). the company’s good will & Future competition. Opportunity: To get link to the up coming technology i.e. Wi-Max. With a slogan of “making it difference”- banglalink started operations in February 2005. Previously, it was known as Sheba Telecom Pvt. Ltd that had been providing GSM (global system of mobile communication) services in Bangladesh since 1998. Orascom Telecom bought 100% share of Sheba Telecom in 2004 and gave its new name as banglalink. banglalink, is the second largest cellular service provider in Bangladesh. As of August, 2008, banglalink has a subscriber base of more than 10 million. It is a wholly owned subsidiary of Orascom Telecom. banglalink had 1.03 million connections until December, 2005. The number of banglalink users increased by more than 253 per cent and stood at 3.64 million at the end of 2006, making it the fastest growing operator in the world of that year. In August, 2006, banglalink became the first company to provide free incoming calls from BTTB for both postpaid and prepaid connections. banglalink provides its powerful network by 5500(approx) BTS (Base Tower Stations) is covering 486 Thanas reasonably and 61 districts, covering a total population of around 90% till mid of 2008. After Govt. withdrawal of the restriction of planting network infrastructure from the three hilly districts (i.e. Banderbarban, Kagrachori & Rangamati) banglalink covered the 64 districts within very short time. The name of present CEO (Chief Executive Officer) of banglalink is Ahmed Abu Domer. The logo of the company is designed on keeping the national animal i.e. Royal Bangle Tiger in mind, which symbolize to the faster growth. During the 3rd quartile of this year which means july-september, 2008 the company earned 524 core BDT. And the companies market expanded to 10.17 million customers. An banglalink’s executive opinion about this was, the quality of product & service and continuous development of network has help them to reach this position. He also hoped that the customer size of the company will increased to 10.35 million by the end of this year. banglalink serves their customers with more than 700 CCP(Customer Care Point). Till now banglalink has invested 6,324 cores BDT. for the development of network and infrastructure. 1500 km. of Fiber Optic cable which gives the surety of good network. During the occasional periods banglalink ensures much better service than the other operators. desh, with the slogan One country, one rate, is one of the cheapest prepaid plans in the country by tariff. ladies, first!, with the slogan Shomporker Network (means network of relationship), is tailored for women. Currently there are three postpaid plans from banglalink. These packages are called enterprise personal. All packages come with T&T local, NWD, ISD and e-ISD connectivity. banglalink points are aimed at providing a complete mobile solution, connections, handsets, accessories and provide selected customer services like SIM replacement, reconnection, bill payment etc. They are strategically located at key points around the country. Kallol Group a local distribution company had partnered with banglalink to operate at least forty banglalink points through out the country. As of March, 2008, the deal with Kallol Group has been called off and banglalink is focusing on managing its own customer care centers. Tradition & culture of Bengal. It is the official sponsor of Bangladesh Tourism Corporation. It has under taken the voting campaign to vote for Cox-bazaar and sunder-boon and cleaning Cox-bazaar. It has provided Trolley for the passengers of Zia International Airport. image. And network coverage (95% of total population). Weakness: Time constant with other companies are not suitable. Opportunity: Rural market & corporate customers. The executive also emphasized banglalink – as best mobile company of the country. And are capable to be a market leader within short period of time. According to him team sprite, superior-subordinate relationship, and working environment is excellent. The company is ready to take any challenges and have the capability to overcome it. Telekom Malaysia International Bangladesh (TMIB) Limited is a joint venture between Telekom Malaysia Sdn. Bhd. (70%) and NTT DoCoMo (30%). Aktel is the third largest mobile phone operator in Bangladesh in terms of revenue and subscribers (8.14 million as of August 2008). In early 2008 Aktel slipped from the second position to the third after facing fierce competition from banglalink. AKTEL launched its operations on the 15 November, 1997 in Dhaka and on 26 March, 1998 in Chittagong. Its founding chairman is Late Mr. Zahiruddin Khan, an ex-commerce minister. AKTEL was formed as a joint-venture between Telekom Malaysia and A.K. Khan Company. All along through its insception it was ranked as No.2 mobile operator and was placed far behind the industry leader GrameenPhone in terms of revenue and no. of subscribers. AKTEL started investing heavily with funds from Telekom Malaysia (the majority stake owner) on expanding its network in 2001 but the investment was far too inadequate in comparison with GrameenPhone’s investment. Aktel offers an array of different packages. In addition to offering the fundamental pre-paid and post-paid mobile services, it offers a wide range of value added products and services such as, SMS, GPRS, mobile data services, infotainment services, SMS banking, Caller Ring Back Tone, Ringtones download, Picture Messaging, MMS, Voice Greetings, Call Blocking on 4th August 2008, which give subscriber to control which call he or she receive or not and Bengali SMS. AKTEL has 19 Customer Care Centers and 200 Customer Service Points in 61 allowable districts all over the country. Aktel has another 670 AKtel Touch Points (ATP) scattered along the most densely populated areas. Aktel has been offering scholarships to three Bangladeshi students every year for bachelor courses in engineering, information technology and business administration since 1998 to study at Multimedia University in Malaysia. It is the founding member of Chittagong Skills Development Centre (CSDC) that is offering technical training and business management education through its strategic partnership with Penang Skill Development Centre (PSDC) of Malaysia and its internal members. It also beautifies the city areas. In 2007 Aktel received Standard Chartered-Financial Express Corporate Social Responsibility (CSR) Award 2006 for their significant contributions to CSR and philanthropic activities. Weakness: poor customer service & late response to competitors offer. system which adopt the Wi-Max technology. Citycell (Pacific Bangladesh Telecom Limited) is the first mobile communications company of Bangladesh. It is the only CDMA (Code division multiple access) network operator in the country. As of 1st March, 2008, Citycell’s total mobile subscriber base is 1.56 million, up 137 per cent or 680,000 from two years ago, giving it the best growth rate of the company till date. Citycell is currently owned by Singtel with 45% stake and the rest 55% owned by Pacific Group and Far East Telecom. Hawaii, Ericsson & Motorola provides technological support to Citycell. The tower range of Citycell exists to 5-6 km. in case sometime it varies to about 9 km.(Max.) The technology used by Citycell is CDMA1X(Code division multiple access). Citycell is consolidating its position in wireless data by launching their Zoom EV-DO (evaluation data optimize) for the broadband wireless internet service. Although CDMA1X technology is the latest technology citycell could not not flourishing the companies market position although it was the first company to launch Mobile cellular phones. Executive opinion abut this is that the failure of the policy maker to take right decision in right time is the main cause . But he also appreciated the policies of present CEO of citycell for capturing the market position. He also thinks that the countries most Mobile companies are GSM, so they may induce the GSM union to capture the market. Citycell offers prepaid, postpaid and fixed phone plans. Since Citycell operates in CDMA, RIM’s are usually sold with a phone mostly cheap Chinese sets produced by ZTE, Huawei, Samsung, Motorola and Alcatel. Citycell currently has the cheapest phone+connection tariff at 1399 taka. It contributes its responsibilities toward countries education, anti-drug & health sector. It is the official sponsor Bangladesh Football federation. Warid Telecom International Ltd. is a GSM-based cellular operator in Bangladesh. Warid is the sixth mobile phone carrier to enter the Bangladesh market. It is currently struggling but is trying to find a way out. Warid officially launched their commercial services in Bangladesh on the May 10, 2007 with a GSM Mobile Cellular network covering 64 districts of the country and encompassing 70% of the mobile phone using population- the single largest launch the country has ever seen. In December 2005, Warid Telecom International LLC paid $50 million dollars(US) to obtain a GSM license from the BTRC and became the sixth mobile phone operator in Bangladesh. In a press conference on August 17, 2006, Warid announced that his network would be activated two months ahead of schedule, in October, 2006. Again in October, 2006 Warid Telecom put off the launch of its cellphone services in Bangladesh until April, 2007 after its major supplier Nokia walked out on an agreement over a payment dispute. The present CEO of WARID Mr. Munir Farooqui. Warid provides both post-paid and pre-paid connection plans. The post-paid plan is branded and marketed across the country under the name Zahi Post-paid, which means leader or royalty. The pre-paid segment is branded and marketed as Zem Pre-Paid. Zahi-Post-paid and Zem Pre-paid user enjoy various value added services(VAS), such as SMS, MMS, GPRS, 64K SIM, Dual SIM product, Corporate packages for product advertising via SMS, and a host of other features. However, International Roaming is available only to Zahi (post-paid) users. Warid has ten customer care centers around the country located at key locations. These centers are directly run by Warid itself. Warid has another 120 franchises spread across Bangladesh, the largest chain of retail outlets in the country, which is further backed up by a chain of sub-franchises, affinity partners & distributors. SIM Cards, Scratch Cards and sometimes mobile sets are sold at these outlets. Bill collection for post paid users and Zem top up for pre-paid users can also be availed at the franchises. These franchises directly appoint dealers and sub-dealers in their designated areas. Strength: Customer service & NGN network. Weakness: Product design & product marketing. Teletalk Bangladesh limited was established keeping a specific role in mind. Teletalk has forged ahead and strengthened its path over the years and achieved some feats truly to be proud of, as the only Bangladeshi mobile operator and the only operator with 100% native technical and engineering human resource base, Teletalk thrives to become the true people’s phone – “Amader Phone”. Teletalk offers an array of different packages. In addition to offering the fundamental pre-paid and post-paid mobile services, it offers a wide range of value added products and services such as, SMS, GPRS, mobile data services, infotainment services, SMS banking, Caller Ring Back Tone, Ringtones download, Picture Messaging, MMS, Voice Greetings. Teletalk has established their customer care point only in the divisional cities and the big citied only. In their CCP’s they provides free services to their customer and also sells the mobile hand sets, and mobile accessories. Which is covered all around the country. Weakness: Poor customer service & bad product design. Threat: other potential GSM companies. Over the last two to three years, the number of mobile subscribers in Bangladesh has been more than or close to more than doubling on an annual basis. By end-2007, the subscriber base had reached 34 million and was continuing to grow at an annual rate of around 60%. With the momentum that has been developed on the back of the government’s deregulation process, the strong growth seemed likely to continue. 1) Total subscribers in Bangladesh will increase from the projected 46.9 million in 2008 to 58.2 million in 2010. We, therefore, forecast that the level of wireless penetration will increase steadily in Bangladesh from our projected 29.0% in 2008 to 34.7% in 2010. 2) The level of competition in the wireless market will continue to increase, and the HHI index will go down from 0.298 in 2008 to 0.285 in 2010. The three largest operators in the country (Bangalink/Sheba, GrameenPhone, and TM International) will be losing market shares to Warid. 3) The largest operator in the country will continue to be GrameenPhone (Telenor), but its market share (by subscribers) will decrease from 45.0% to 42.9% in the forecast period, 2008 ? 2010. In the figure below BMI (business monitor international) had forecasted a rapid growth and average y-o-y growth of 56% per year between year 2007 and 2011. The reality is close to the forecast. According to BTRC, The total number of Mobile Phone Subscribers has reached 32.33 million at the end of October 2007, when BMI’s expectation was about 35 millions. Mr. Manzurul Alam, Chairman BTRC while answering a question, has given the latest information. As of April 2008, the total number of mobile phone subscribers stands at 40.34 millions. And the average growth rate falls in the range of 1 million subscribers per month. Beside the six mobile telecommunication companies there are twelve PSTN (public switched telephone network) – companies in Bangladesh. Among these BTTB was only govt. owed company, which has been converted into Public Ltd. Co. in august this year and now it is working as a name BTCL (Bangladesh Telecommunication Company Ltd.). Accept BTCL all other PSTN use wireless system CDMA (Code division multiple access) technology. The raise of private PSTN companies made the market of PSTN in the country very competitive. Now the call rate of PSTN has been reduced than the previous rate. The buyer is powerful in the industry, but since the market is growing largely, it will be easy for the company to hold its own share, because of poverty, the population will be unlikely to avail the switching cost. And this also reduces the risk of high availability of substitutes. The supplier is not powerful in this case which is a plus for the company and the company can play with the price to keep the production cost low. Since the markere t is yet to be matured and growing very fast, we assume that the suppliers companies are also increasing. Some multinational companies are showing their interest to enter into the market. This can lead some new suppliers to arrive into the market and make the environment mocotive. So at sommpetie stage the bargaining power of the suppliers will become very low. So from the above discussion, it can be said that the Bangladesh telecom market has a lot of potential to offer considering strategically ignorable or somehow alterable threats. The market looks very potential and prospective. Lots of opportunities are waiting. Bangladesh has cheap skilled and willing to be skilled labor. Communication infrastructure is in good condition and has the ability to serve the international entrants. Customer demand for telecom product is very high due to the high growth rate of the market. As the industry is becoming bigger, availability of supporting industries are increasing and already there are lots of supporting companies in the market. And finally the government policies are very welcoming and liberal. From the above discussion we can comment that the mobile telecommunication of Bangladesh is very competitive & the rivals are facing huge competition in the market. Therefore we observe that the mobile companies are changing their strategies day to day to survive in the market. So it will be difficult for any new company to enter in this market. But we can simply say that the mobile telecom market of Bangladesh is a well balanced & fully competitive.